These four pictures illustrate how very short the day is in this latitude at this time of year. I took all four photos from my balcony, looking south. The first, below, was taken just before 8.30 in the morning (just before the street lights were turned off and the morning officially started). You can see dawn in the sky. 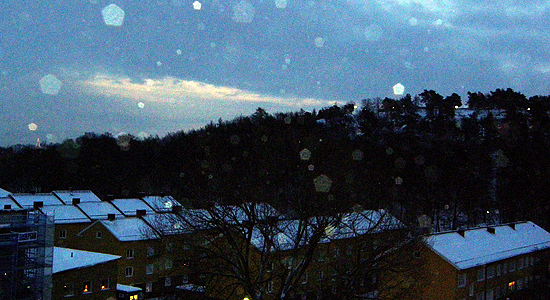 I used a flash, and those artefacts you can see are snow crystals in the air reflecting the light. I couldn’t see them or feel them, and at first I thought I’d got the lense dirty! This photo I took at about 2 p.m. 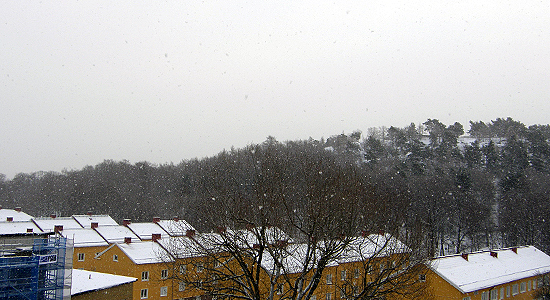 The sun has vanished behind the clouds again and the snow is coming down. Finally, this photo was taken at about 4.45 in the afternoon. Or ‘night’ as we like to call it hereabouts. The sun has set and the street lamps are on again. 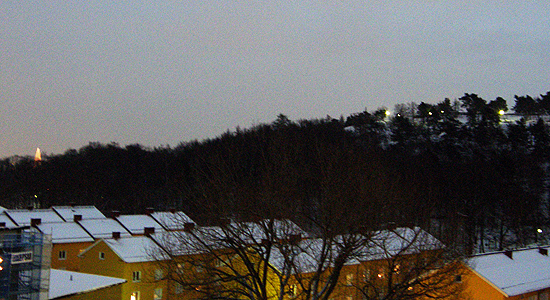 The little triangle of lights you can see to the far left, just poking above the treeline, that’s the tower of the Liseberg amusment park, decorated to look like a sort of Christmas tree. Tonight, the night between the 21st and 22nd of December is the winter solstice, here in the northern hemisphere. The longest night of the year. 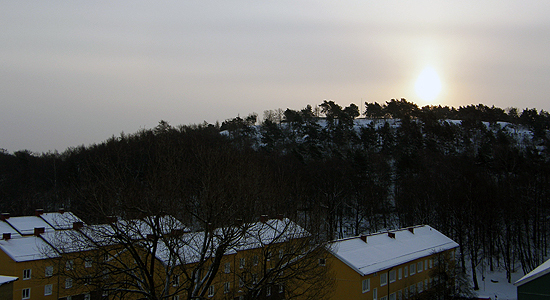 from now on the days will grow longer and longer till we reach Midsummer again in June 2011. Hurrah! You might like to compare these photos with the ones I took last Midsummer. Here. Muito obrigado por estas fotos maravilhosas! You are so very welcome. Glad you liked them. Você é muito bem-vindos. Estou feliz que você gostou das fotos.